A stylish eclectic apartment with contemporary furnishings and appliances offset against textiles, chairs and stools from Ethiopia, African sculpture, textiles and a little flavour of Africa. Beautifully presented and recently renovated Grd entry room with stairs to first floor 2 bedroom apartment with designer kitchen and luxury Queen size bed as well as second bedroom with King size bed which can be separated to make comfortable single beds. To keep things comfortable the apartment has air conditioning/heating, Double glazing for warmth & noise reduction and leather lounge. To relax the apartment has a 37" High def LCD TV with digital tuner and DVD player or enjoy the the balcony with outside table and chairs. Complimentary first morning light breakfast pack including Coffee, Tea, Cereal, milk and bread and spreads provided plus eggs from our chickens when they are laying. The service is always available for standard email and browsing but is not suitable for gaming nor downloading large volumes. Hopefully it will improve when the NBN cable arrives. Facilities include a fully equipped kitchen, hair dryer, dishwasher, on site laundry and one undercover car park. 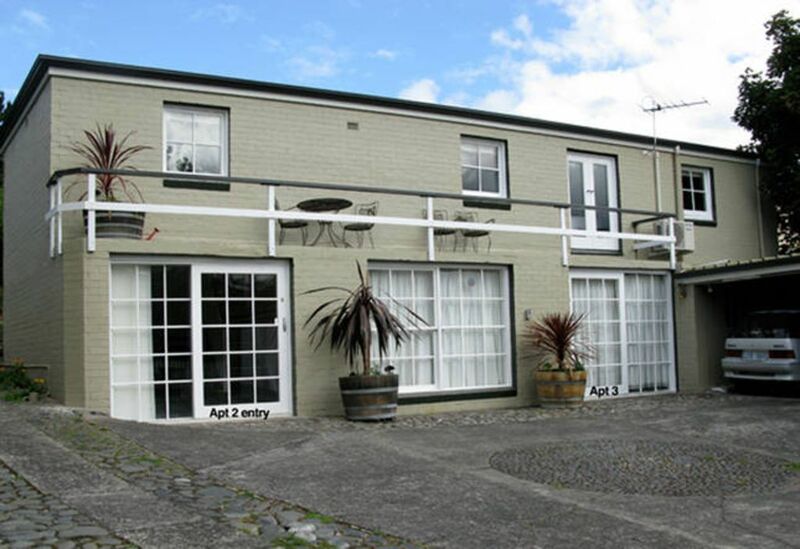 Toogooloowa 2 is superbly located at the quiet end of Davey Street with an easy 1.8 km walk down to the Hobart CBD, Salamanca and the waterfront or to the University of Tas. This apartment occupies the upper floor of the stables in the grounds of Toogoolowa a beautiful heritage listed Victorian mansion which surrounds the original colonial 2 room cottage built as the first dwelling in the area during the early 1800s and the Georgian extension that was built over and around the cottage some years later.